For those who are not familiar with the concept – basically, during Passover, people who strictly observe Passover do not eat anything made with flour. Some people don’t even eat rice and legumes, depending on their families’ tradition. Think about it – abstaining from pizza for a whole week (that is definitely the hardest thing for me). The occasional (frequent) pizza-craving aside, main dishes are normally not so much of a problem, since there are plenty of dishes that can still be enjoyed on Passover even if you are observing it food-wise. Desserts, on the other hand, are a different story. But you know me. I don’t give up so easily. 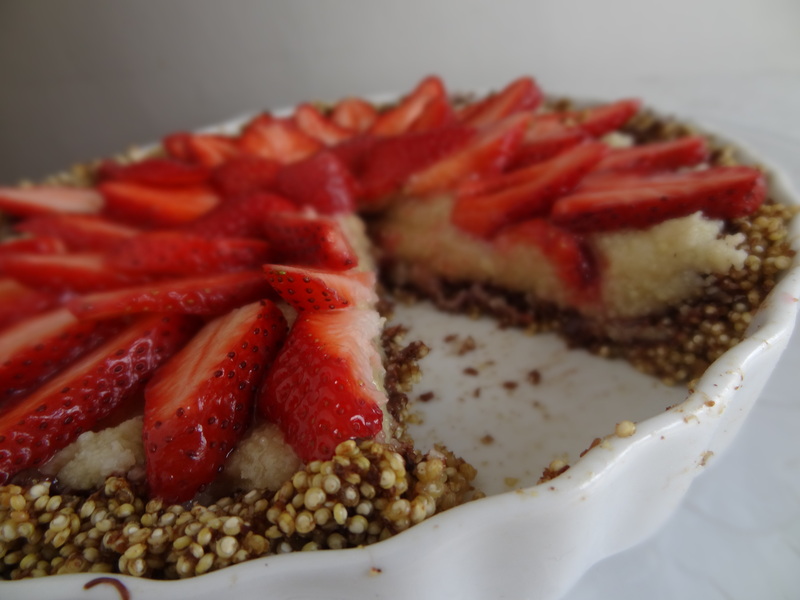 This Passover, I have set out to go beyond the obvious mousse / meringue desserts, and experiment with different mediums for different yummy foods. 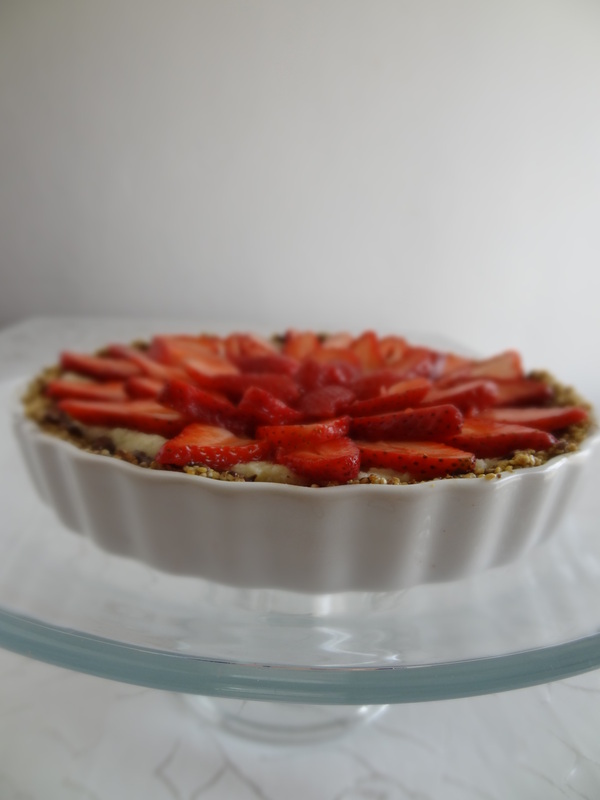 This tart features a combination of things you just CAN’T go wrong with, as well as a somewhat innovative addition. 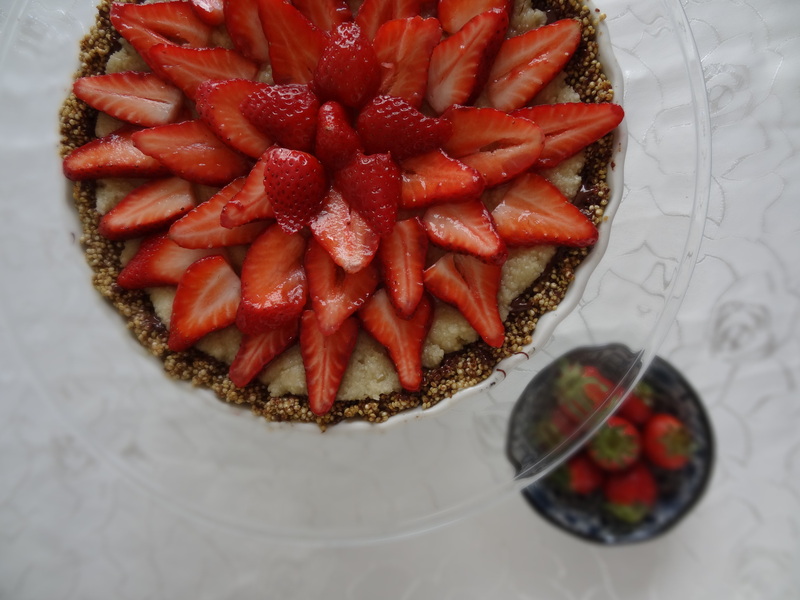 What do you get when you combine dark chocolate, sweet marzipan, and tart strawberries? Yeah, pretty much heaven in your mouth. I thought so, too. 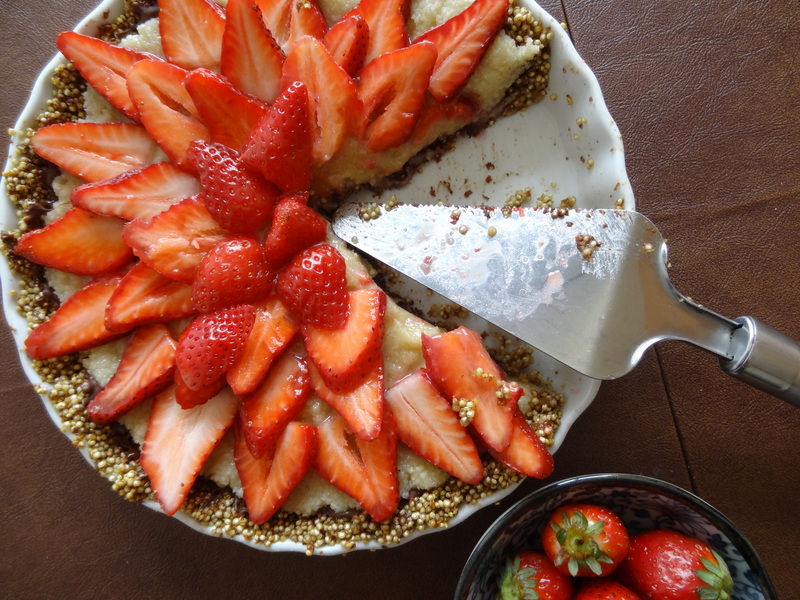 But let’s say you want to tie it all together nicely in the form of a tart. 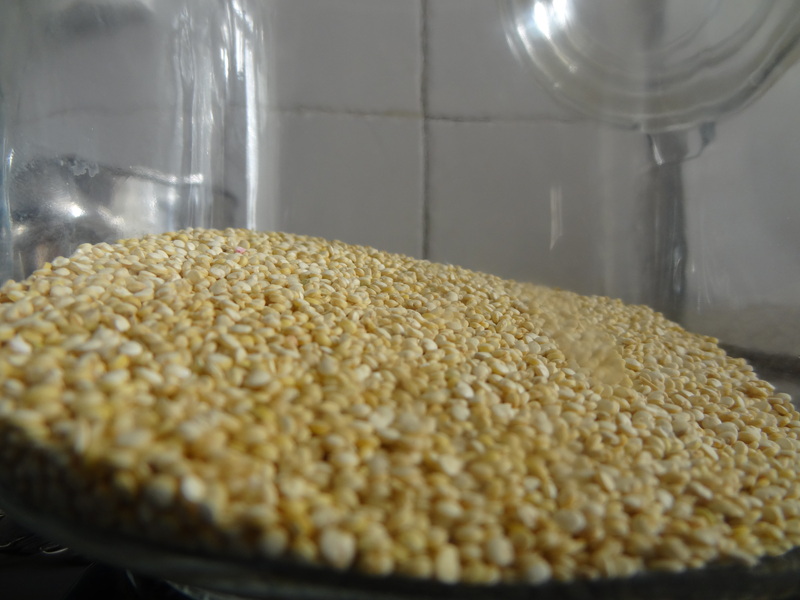 And let’s say you (or your guests) want to avoid flour, and the only legume- or grain-like thing you/they can tolerate is… Quinoa. Do you see where I’m going with this? I got this idea after reading about a kale quiche made with quinoa crust, and thought to myself, Hey – if it can work for quiches, it can sure as heck work for tarts. I have many other plans for recipes to publish here this Passover, but this one is definitely a keeper! Estimated Time: 40 minutes prep + 20 minute bake + cooling time. Preheat your oven to 180 degrees Celsius, which are 350 degrees Fahrenheit. 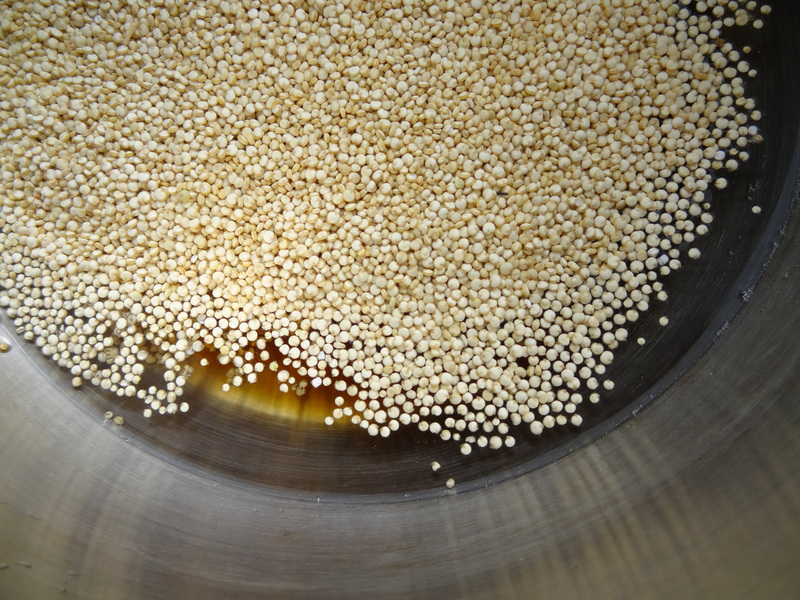 We are going to start out by cooking the quinoa in a very diluted simple-syrup. 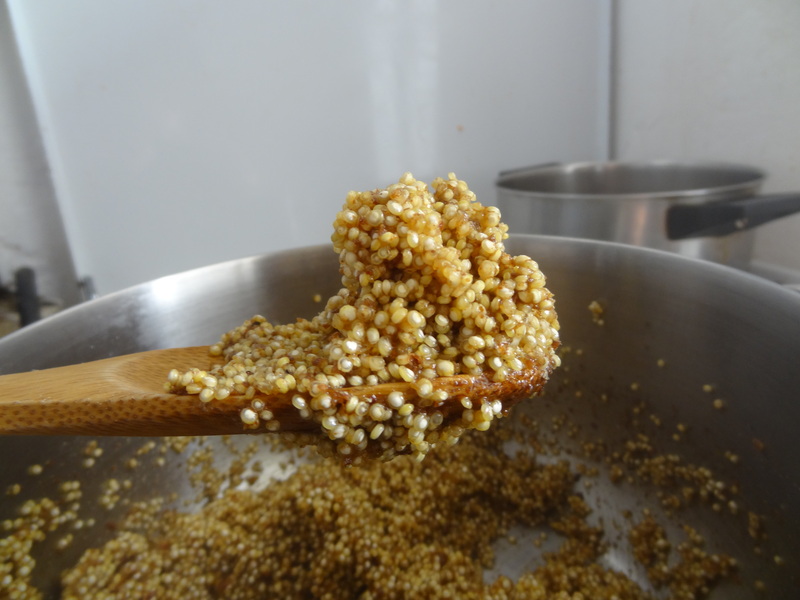 Heat the water, sugar, and quinoa in a small pot and bring to a boil. 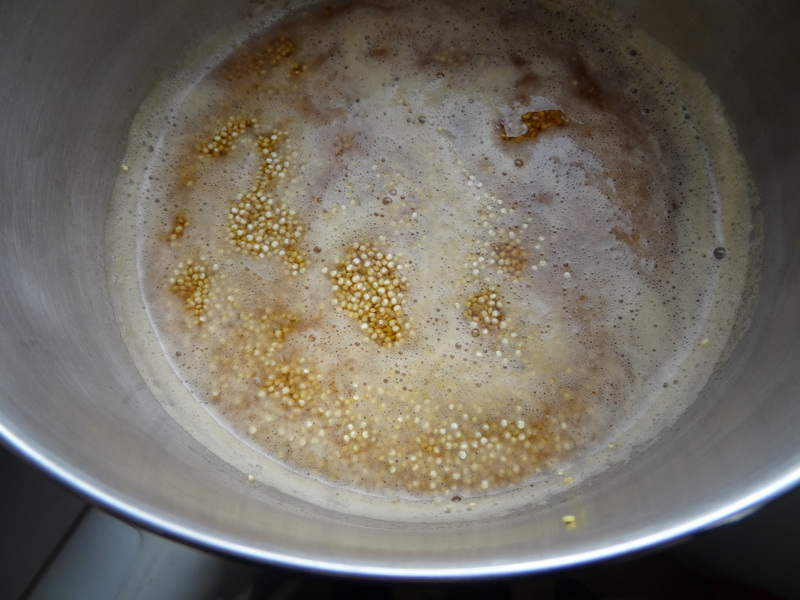 Then simmer until all the liquids are absorbed – about ten minutes. 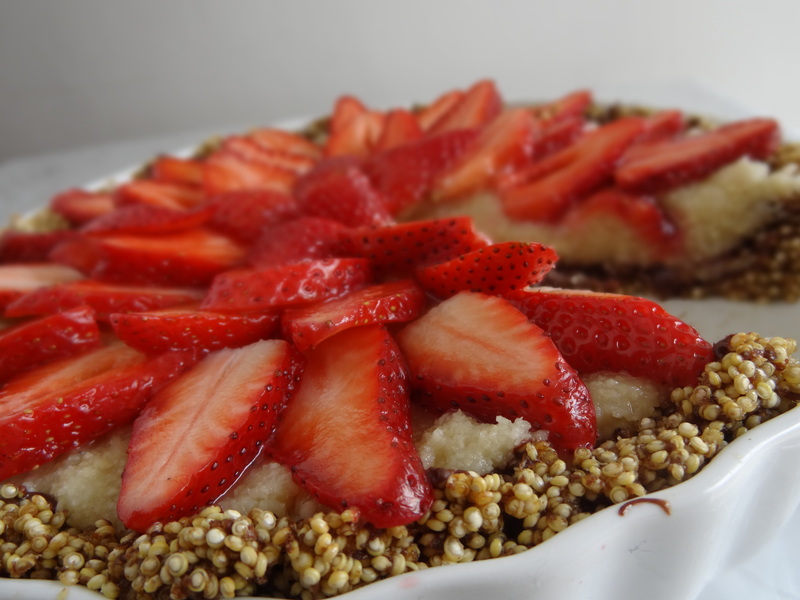 Don’t worry if the quinoa is a little “al-dente” – it will still be great in the crust. 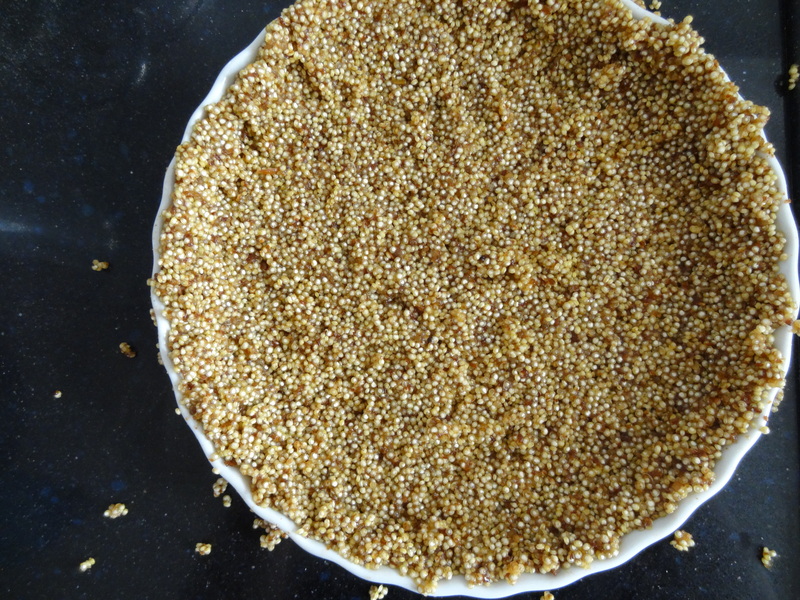 Transfer the quinoa to a 25 cm (10 inch) pie dish, and press it down so it forms a crust. Bake the crust for 40 minutes or until golden brown. While it is baking, make the filling and the chocolate layer. 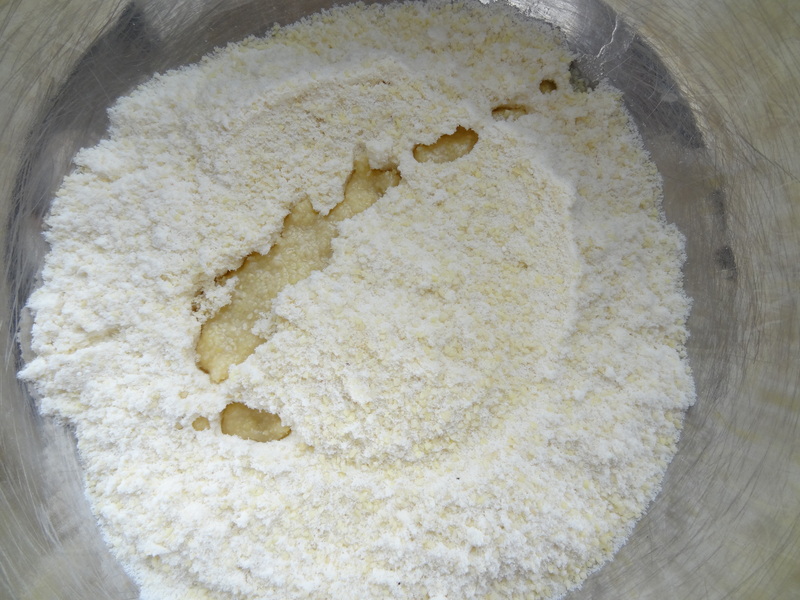 Just sift together the almond meal and powdered sugar until all that’s left in the sieve are the bigger, coarser almond pieces – and the fulffy, powdery, good stuff is in the bowl underneath. 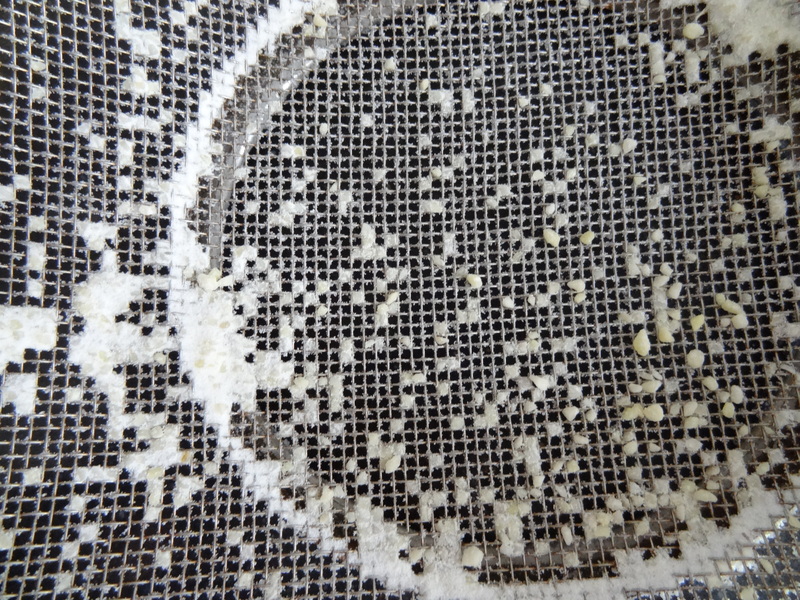 Unlike in marzipan, if there is a substantial amount of coarse pieces left in the sieve and you feel ripped-off, you can add some of it back into the sifted stuff in the bowl (and make a mental note to yourself to use a different brand/store next time). This isn’t going to be used as marzipan which is best super-smooth, so it’s ok to have a little bit of chunks here and there. Next, mix together the lemon juice, lemon extract, and water in a cup. 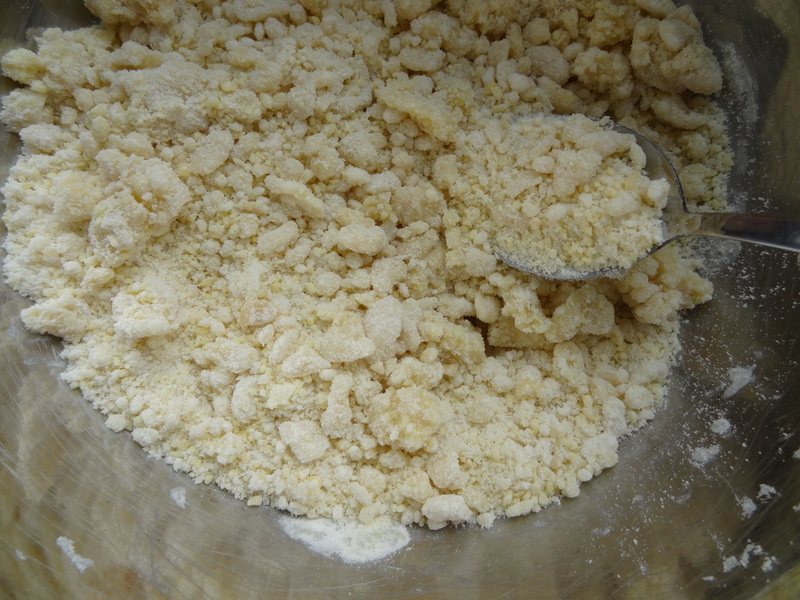 Stir one teaspoon of it at a time into the powdery mix, until the desired consistency is reached. It will start to clump, and then get more and more uniform. 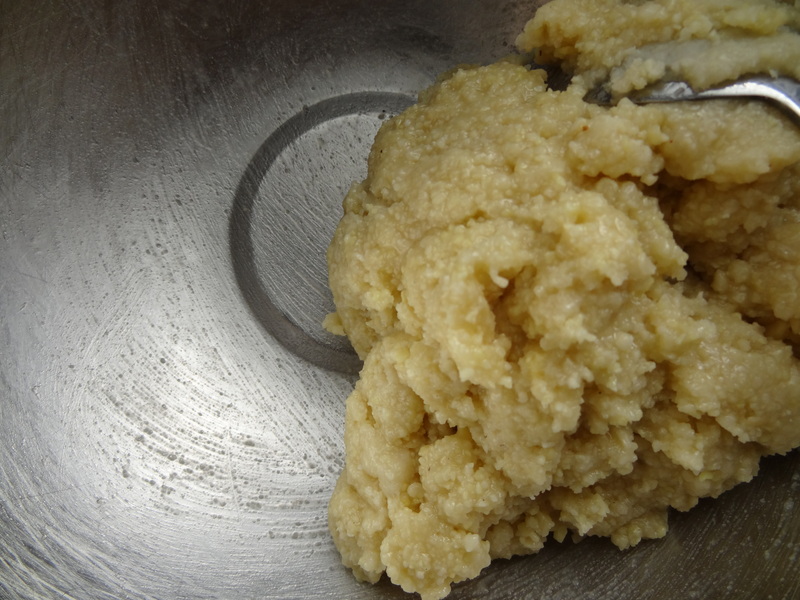 What we are looking for is “dough-like” almond paste that can pack together, and leaves moisture “tracks” on the bowl when stirred (as seen in the third picture from here). 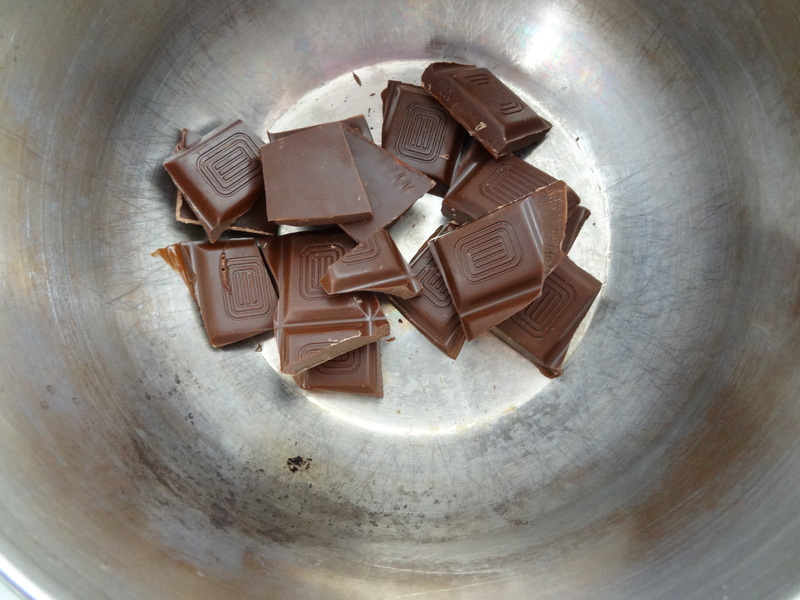 Set the almond filling aside, and melt the chocolate in a small saucepan. If you are easily distracted or your stovetop is known for torching things, I recommend using a double-boiler. 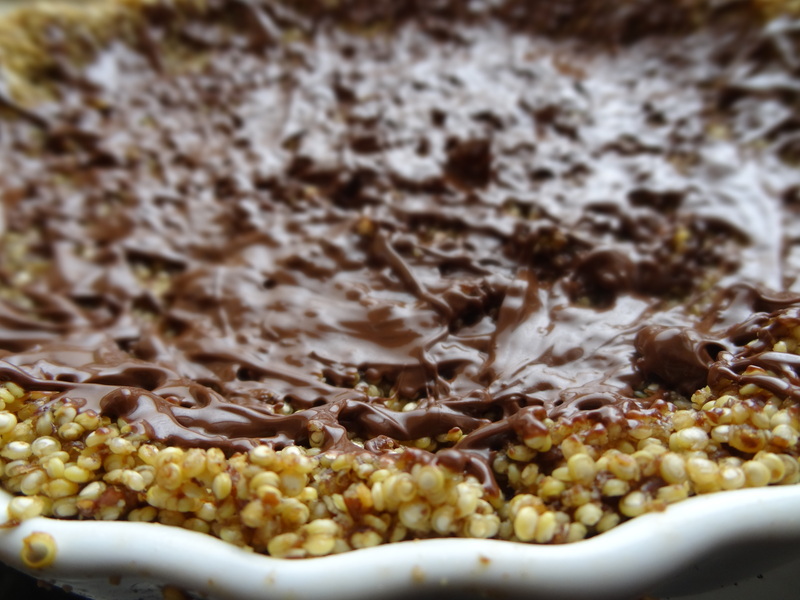 At the end of the 40 minutes, take the crust out of the oven and cover the top with the melted chocolate. 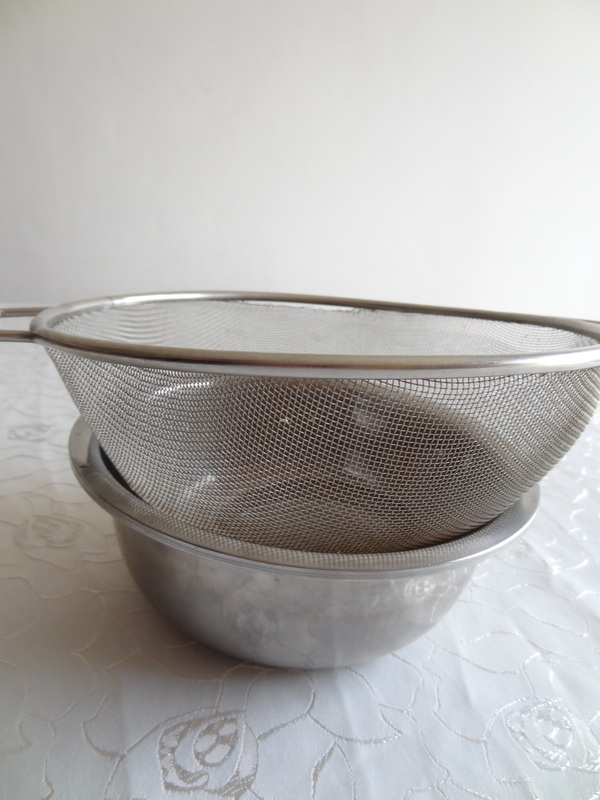 This is a trick I learned from Ilan of The Iron Whisk – it helps to keep pie crusts from cracking and pie fillings from leaking through. And, dark chocolate goes great with marzipan! 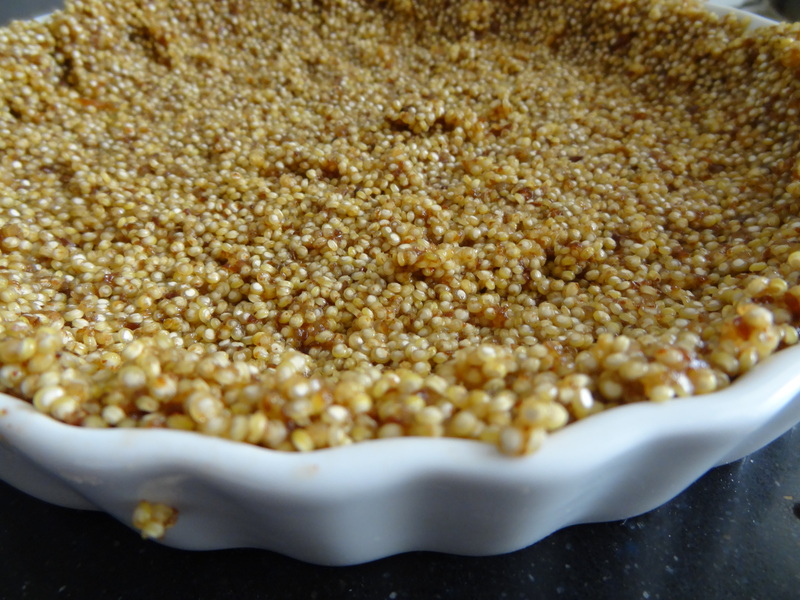 It’s a bit tricky to brush the chocolate on (the top quinoa grains tend to stick to it and come off the crust), but you can drip it evenly and then use a spatula to gently spread it. The longer the crust is baked, the easier it will be to spread on the chocolate, but it will also be more and more crunchy. Now is the hard part – letting this baby cool before the final assembly. 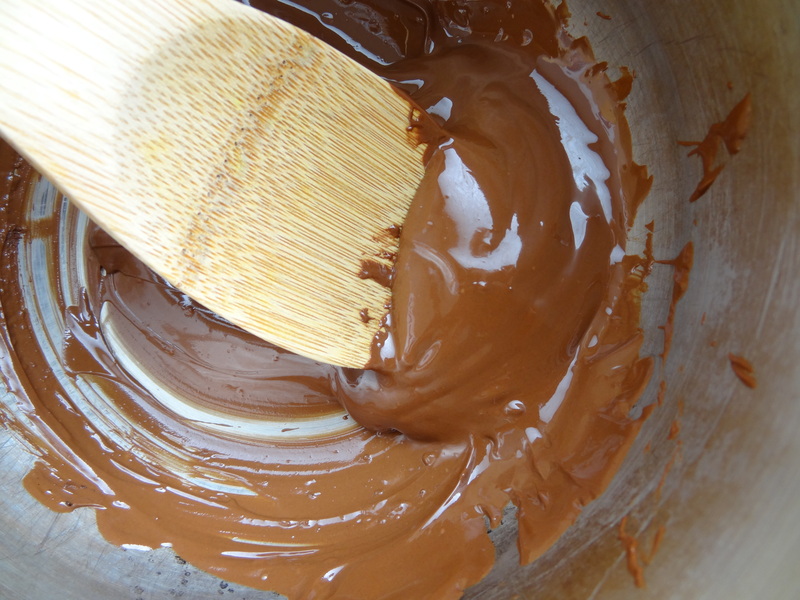 When the chocolate has hardened, put in the almond-paste filling and spread it out. Mine was thick enough to kind of shape and flatten in my hands before laying on the crust itself. 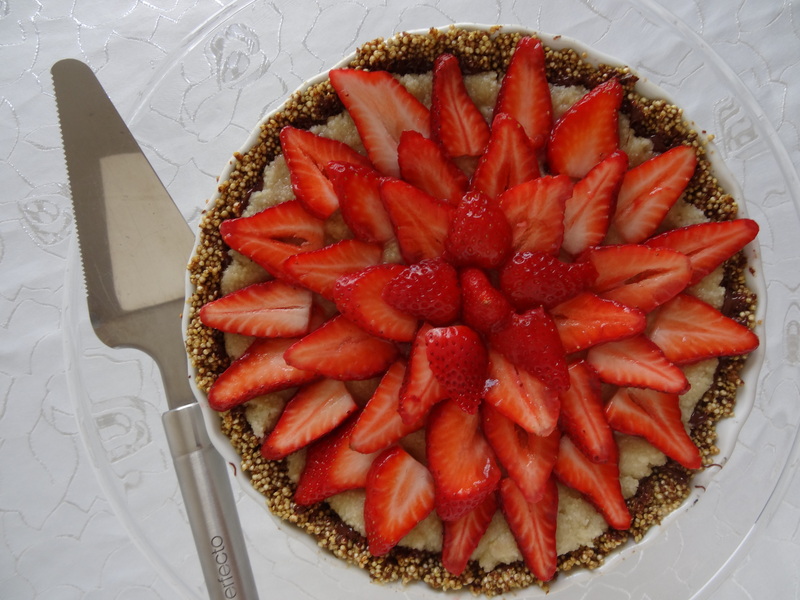 Almost done… Now, just slice up some fresh strawberries, and arrange on top however you like! 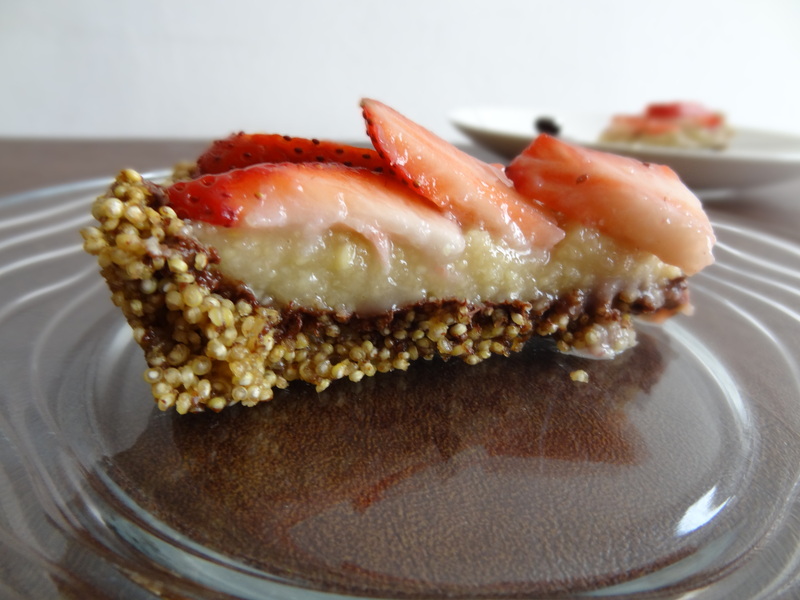 There is no need for glaze to top off this tart – it is very rich and satisfying, and the flavors work very well together – the richness of the marzipan and the dark chocolate, against the tartness of the fresh strawberries, and the satisfying crunch of the sweetened quinoa crust. Another plus to this dessert – I am the type of person who needs to have breakfast within 30 minutes of waking up or else I am hungry all day. 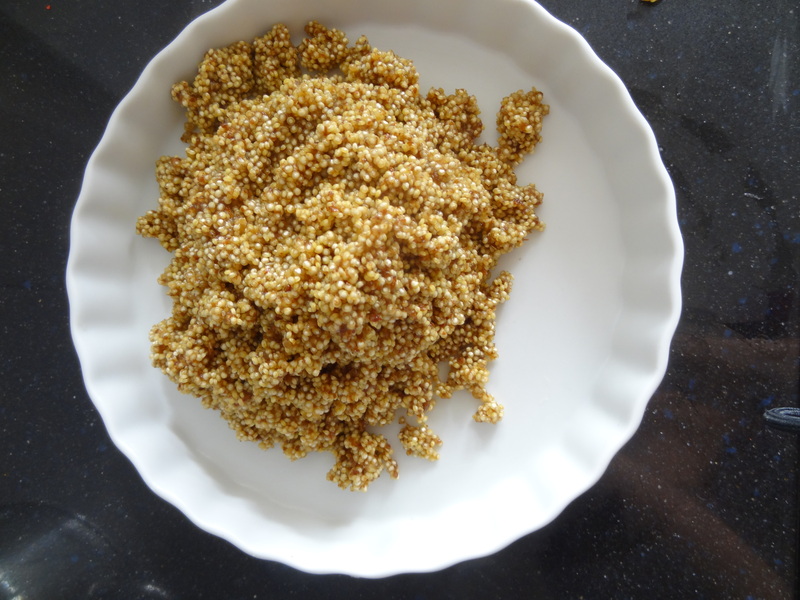 I normally have eggs or yogurt which keep me full until lunch… But we ran out of yogurt so I had this for breakfast for the past couple of days and I can testify that it is very filling – probably thanks to the quinoa! 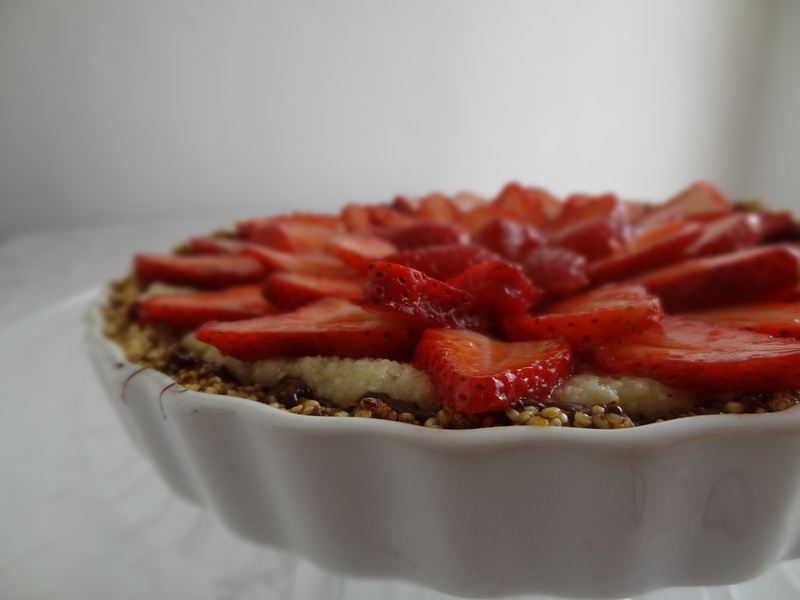 **If you have any sweet-quinoa left, you can cook it in milk and eat it as quinoa-pudding… Or use as a topping for a yogurt-and-fruits breakfast! 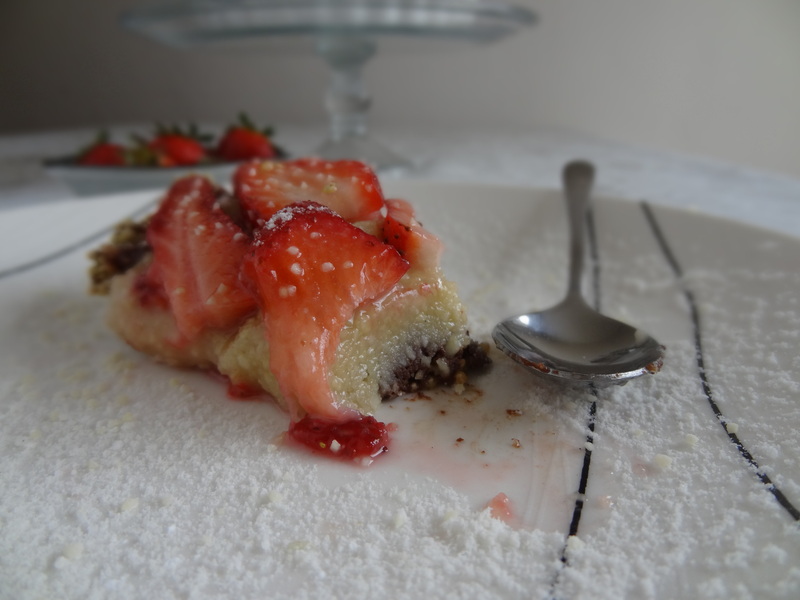 If you have marzipan left – keep it! 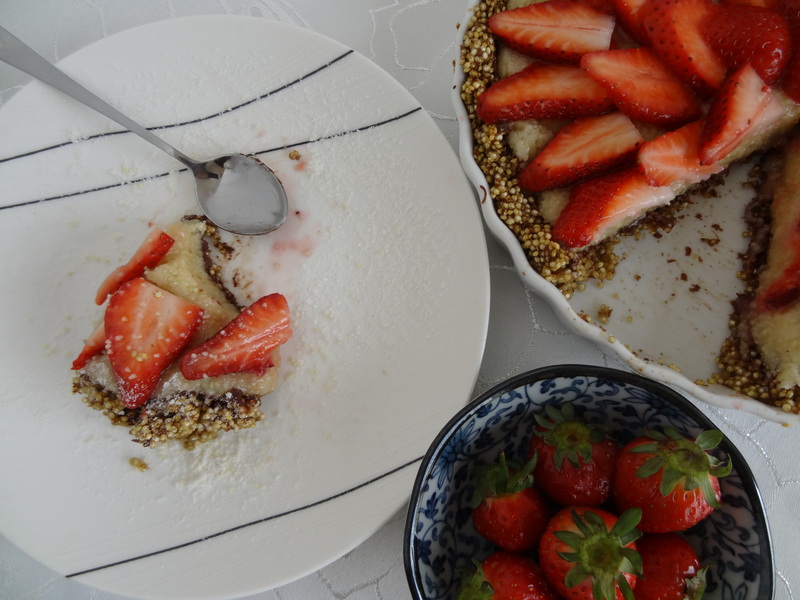 It’s delicious eaten with a spoon alongside a good, strong cup of tea (or coffee! ), and also works as a filling for other bakes goods, like these purim cookies. 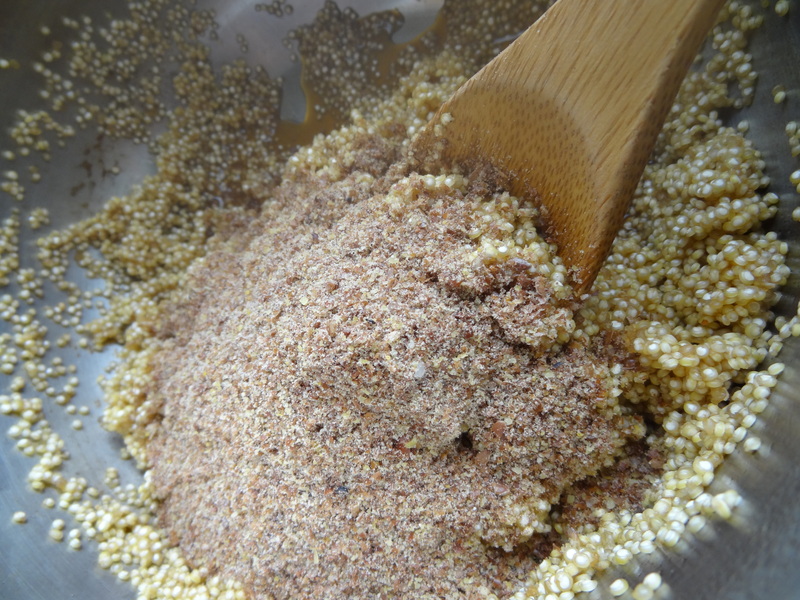 Cook 3/4 cups quinoa in 1.5 cups water with 4 Tbs. brown sugar. Bring to a boil, then simmer liquid is absorbed (about ten minutes). Stir in 4 Tbs. ground flax and 1 tsp almond extract. Press into 25 cm (10″) pie pan and bake for 40 minutes or until golden brown. 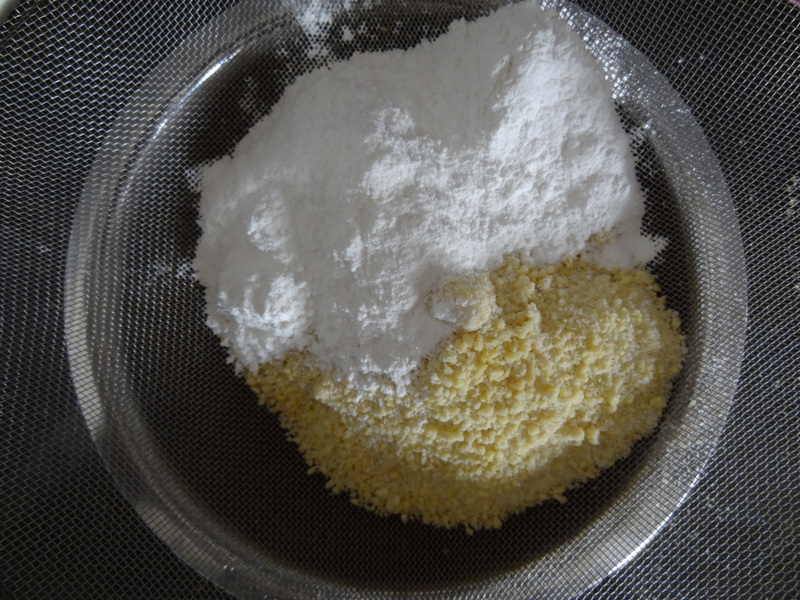 Process (or sift) together 250 grams almond meal and 200 grams powdered sugar. Stir together 1 tsp lemon juice, , 1 tsp almond extract, and 1/3 cup water. 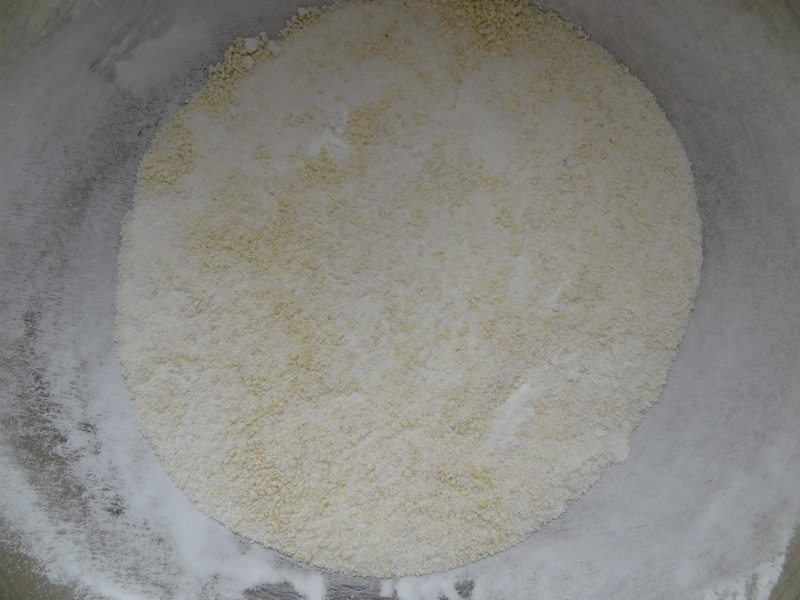 Gradually combine the liquids with the powders until desired consistency is reached. Set aside. Melt 100 grams dark chocolate. Take crust out of oven and cover it with melted chocolate. Let cool and harden. Fill the crust with the almond paste filling. 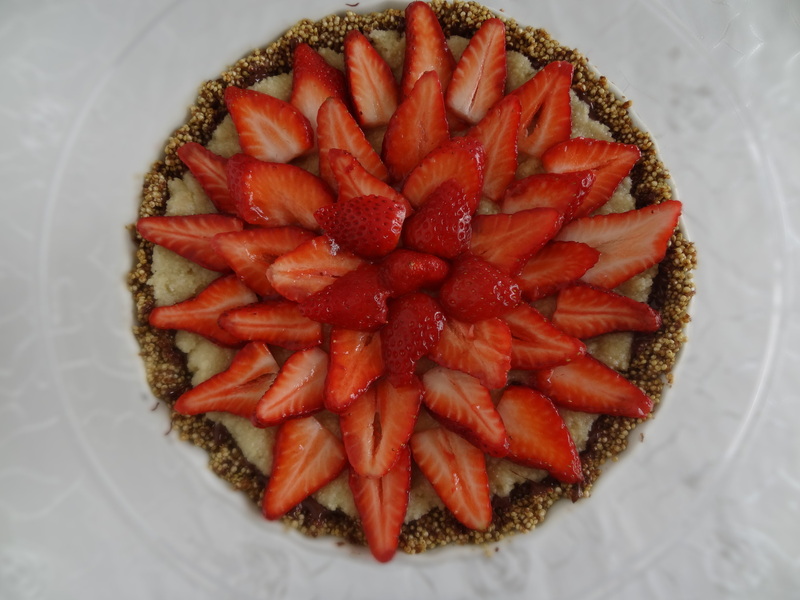 Cut the strawberries and arrange them on top of the tart. 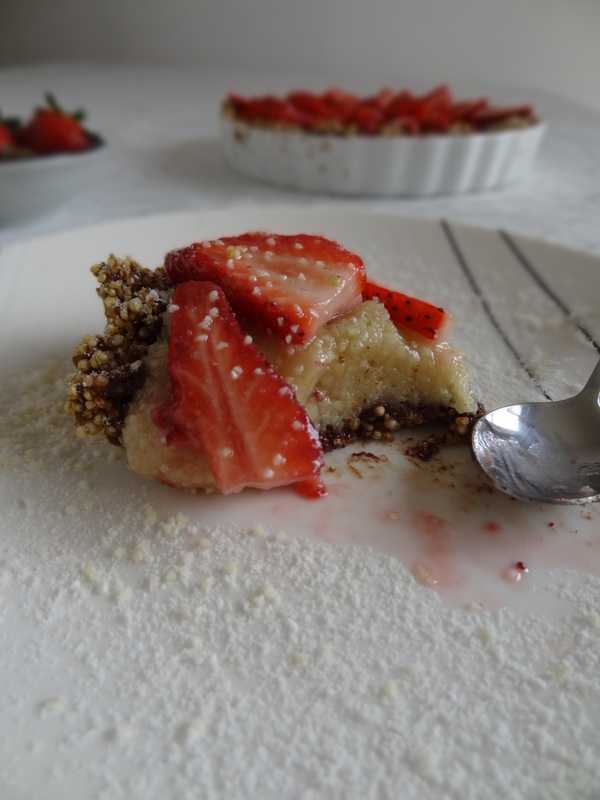 This entry was posted in Desserts & Sweets and tagged almonds, chocolate, gluten-free, marzipan, non-dairy, Passover, quinoa, special treat, vegan by Adi. Bookmark the permalink. 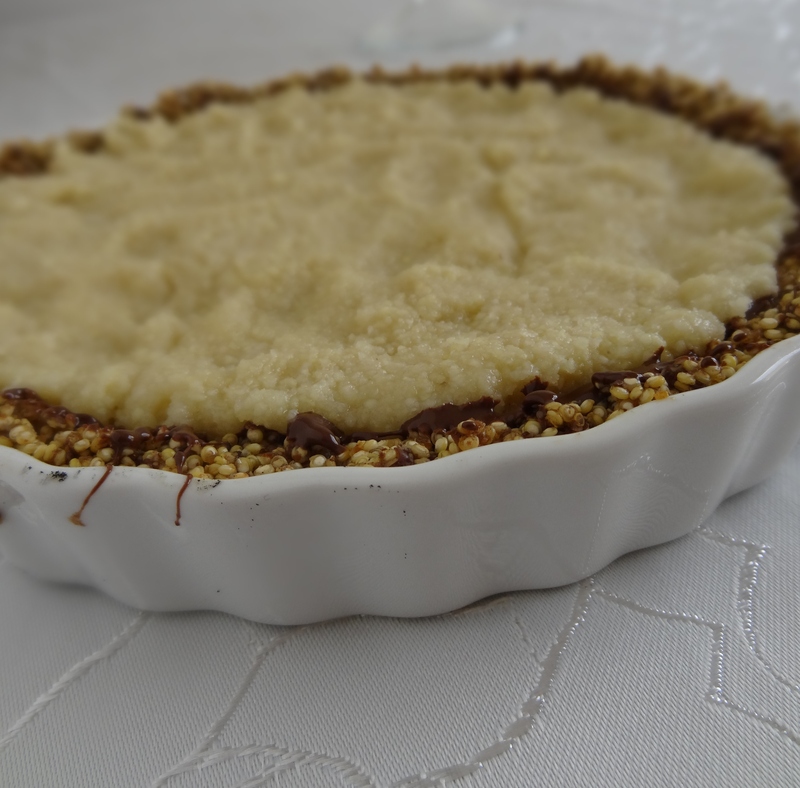 Tried this recipe today, but switched the marzipan for a dairy almond cream, which meant another bake after cooling the chocolate on the crust. I loved how it came out, but unfortunately, the crust simply would not come off of my dish, so it was kind of a mess to slice :( otherwise delicious! People were surprised to learn what the crust was made of, but they ate it up!! Thanks for a great recipe! I’m so happy you made and enjoyed it! 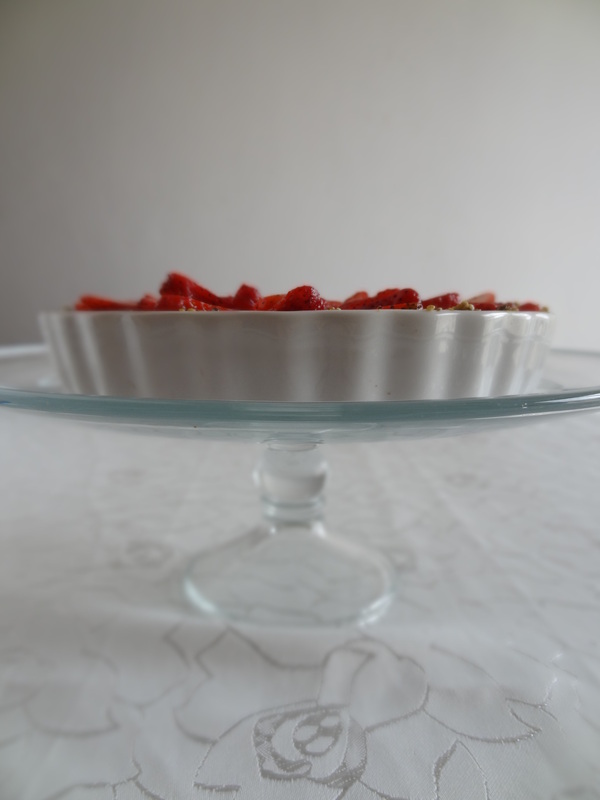 I also made it last night and this time used a different pan – my crust stuck as well! Thanks for trying out the removable bottom pan ;) How did the chocolate layer hold up with the second bake? Chag Same’ach! I think next time i’ll use baking paper to keep the crust from sticking. The chocolate actually held up quite well with the second bake, possibly melted a bit into the crust, but there was a defined chocolate layer between the crust and the almond cream. FYI- i just got responses that it tastes even better the second day :) Thanks for the recipe! Ps- I used a removable bottom dish and feel like this recipe is better done in a dish like you used, as the pie really came apart..